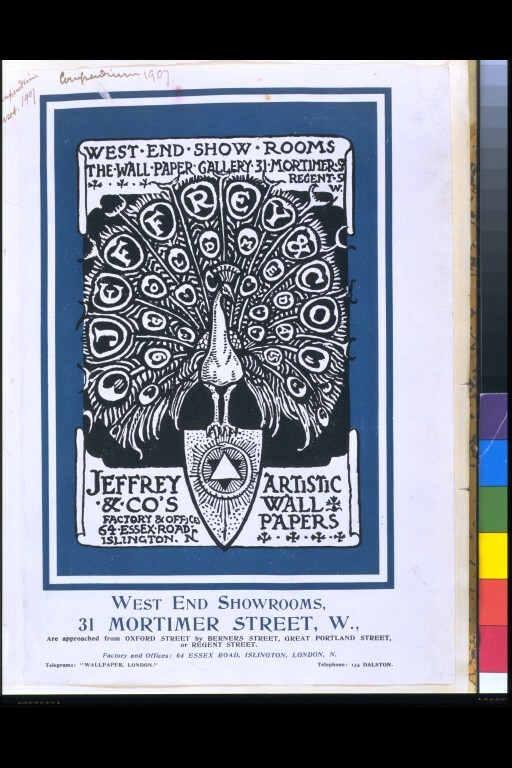 The peacock was an established symbol of the Aesthetic movement (‘Art for art’s sake’) of the 1890s, and around 1900 Jeffrey & Co. adopted it as their logo to emphasise their association with the highest artistic standards in design. 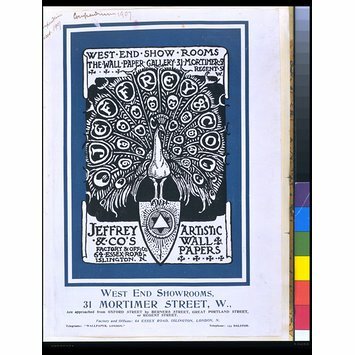 They had printed William Morris's wallpapers since 1864, and under the guidance of the sole proprietor, Metford Warner (from 1871), they employed some of the best designers of the day - including Walter Crane, Lewis F. Day, B. J. Talbert and C. F. A. Voysey. The firm's products regularly won medals and prizes at international exhibitions. One of three volumes containing bills (circa 1838), pamphlets, press-cuttings, price lists etc (circa 1848-1915) and account book (for 1869), all relating to wallpapers produced by Jeffrey & Co. Page 52 is an advertisment for Jeffrey & Co. Artistic Wallpapers, featuring a peacock with 'Jeffrey & Co.' written in his feathers; Lithograph on paper. Given by Mrs Margaret Warner. 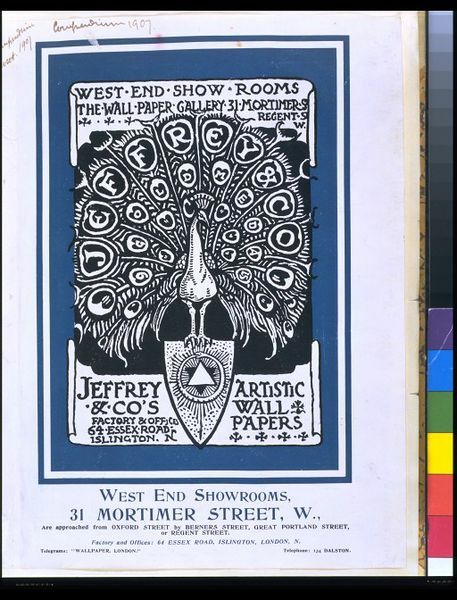 One of three volumes containing bills (circa 1838), pamphlets, press-cuttings, price lists etc (circa 1848-1915) and account book (for 1869), all relating to wallpapers produced by Jeffrey & Co.; Page 52 is an advertisment for Jeffrey & Co. Artistic Wallpapers, featuring a peacock with 'Jeffrey & Co.' written in his feathers; Lithograph on paper. ; England; ca. 1907. Saunders, Gill. Wallpaper in Interior Decoration. V&A Publications. London. 2002. pp. 35, pl 28.